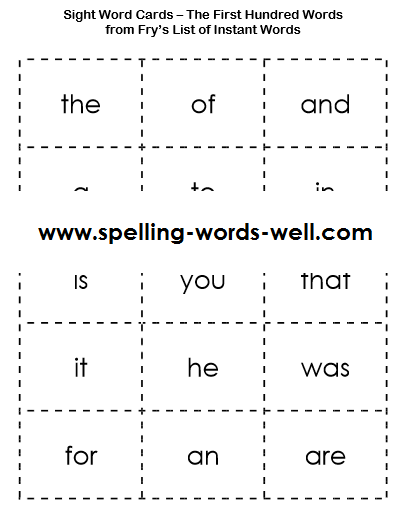 Use these sight word cards to help your early learners practice the first 100 Fry Instant Words. When children can recognize these words instantly -- and when they can also spell them quickly -- they are on their way to being confident readers and writers. What could be better? Here's a peek at the first page of flash cards. The printable list contains the first 100 of Fry's list. Find links to more Sight Word Flash Cards below. 1. Expect your child to master a few words at a time. 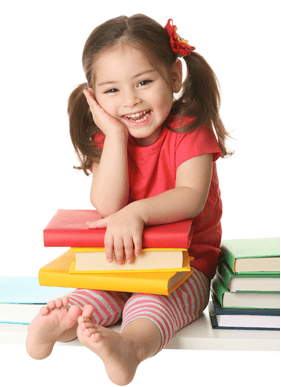 Don't start with the stack of 100 words if your child is just starting to read. Begin with 5-10 words. When s/he is really fast with those, add in a few more. Or switch to another small set, then combine the two sets for review. 2. Make two copies of the same small set of words. Cut them apart, mix them up, and turn them upside down on the table. Play a Concentration game in which your child tries to make matches. This is good for teaching visual discrimination as well as building memory skills. Ask your child to read each word card as it is overturned. 3. In the classroom, assign partners to work together to quiz each other on reading the words quickly. 4. To build spelling skills, write one of the sight words on the board, omitting a letter. Then read a sentence using the word. Ask students to supply the missing letter. Example: Write f o ___ Say: This package is for you.